I keep signing up for challenges, but maybe not, exactly finishing them. Good list! The only one I have read is Catching Fire. I want to read the Nancy Farmer book, but the library doesn't have it! Good luck! I really liked House of the Scorpion. I listened to it on audio with my sons and they liked it too. Dark, though. amy - and it is still fun to sign up for challenges, and attempt them. kailana - I was at Indigo the other night so I picked it up. Plus, I expect my son would read it too. I am looking forward to Catching Fire. michelle - I read the back of House of the Scorpion from a student who had the book in class. It looked very good. Great to have you aboard! You've got a great list of books there. I was tempted by this, but since I still have like 20 to finish this year it would be pushing it... :-) I hope you're wrong about challenges being on their way out, I'm looking forward to making my lists for next year!! 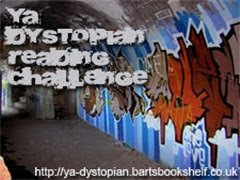 bart - dystopian is a genre I quite enjoy, and my 11 year old son reads them as well, so it's fun to talk about them with him. He's already read the first 2 on my list. I'm trying to catch up to him. booklogged - all in moderation, eh. Glad you've got things under control and are getting back into joining some challenges. joanna - I didn't look how many books I had to read for other challenges before I signed up for this one. Oops! I think I'm in good shape though, and YA books are usually quick to read. And you only pick between 1 and 4 books, so 1 is easy to read. I noticed a few people are backing out of challenges but I'm just getting back into them. Bart tempted me. I'll be posting about my planned reads, soon. Catching Fire is among them. And now, after two years plus doing this, I've finally had a couple of challenge ideas... but your opening sentence scares from doing it! Because I've been thinking the very same thing. We'll see I guess.